Prevention is the most economical and effective approach when dealing with algae, however, even the best maintained pool or spa may experience algae problems. Therefore both preventative and treatment algaecides are available. 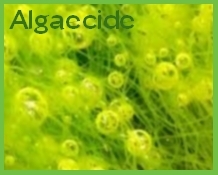 Green Out is a highly effective, fast acting algaecide for treating green algae. Now also available in 1.5 litre bottles for larger pools. Black Out is a highly concentrated algaecide for treatment of black algae. Now also available in 1.5 litre bottles for larger pools.